Installing a new sod lawn is a rewarding and satisfying experience for any home owner, but commercial sod installation can be expensive. If you want to save money on a new lawn project and get the satisfaction of doing it yourself then we have the right equipment to help you finish your new yard installation. You don't need to hire a crew of experts to make your yard thick, green and beautiful! There are two different ways to install your own lawn. One using sod and the other using seed. We also have a separate how-to that explains how to install a new lawn using seed. Sod is grass that has been grown in a field on a farm. It is harvested in sheets. When it arrives at your home, it is laid on freshly prepared soil. These sheets grow into a new lawn. Generally speaking you pay a bit more upfront for sod and have to work a bit harder to install sod. But, you also get to use your lawn sooner with sod. Sod can be installed any time of year if your soil has been prepared. Obtaining new lawn greatness take a few important steps and about a weekend of your time. You can use a tape measure, a landscaping or contractors measuring real or even your walking stride to calculate the area of your lawn. Be sure to measure the length and the width of the lawn to be installed and multiply the two together. With this information you now have your lawn square footage (sq.ft.). When you use sod, your choice of species will be limited to the species already in the sod. Here in NW, Oregon perennial ryegrass is the dominant grass in our sod. Much of it is grown south of Portland where it is usually cut fresh and shipped the same day to Portland area homes or retailers. This is a good choice if your lawn is “normal” for the area. Not “normal” would be extremely wet or dry or sunny or shaded, etc. Occasionally you will find specialty sods at retailers. Now is time to rent a sod cutter. The cutter slices the old lawn into sheets. After the sod is cut; you roll it up in 3-5 ft sections and remove it. It is best to have an advance plan to deal with the cut sod. Your old lawn is heavy and the rolls will take up a lot of space. A “drop box” can be ordered to your house so a big truck can haul away the sod. You can let people know on craigslist that you have “free sod” or you can use the sod rolls to make a berm in a new location of your property. What ever you do, have a plan for the old sod before you start the project. Now that the sod is gone, it’s time to remove all of the roots, clods of grass and weeds. Be sure the soil surface is clean before going to the next step. It will be a lot easier to use the tiller if the soil area is free from debris and other items. Topsoil or compost at a rate of 2-3 inches over the whole lawn area. This will improve fertility and make a lighter soil. Turface at a rate of 50-100 lbs per 100sf of lawn. Use Turface if you want to improve drainage and add longer lasting loft to your compacted soil. Turface is also great if you want a more convenient amendment than topsoil or compost. Lime at a rate of 10 lbs per 100sf of lawn. Use lime if you have acidic soil often associated with moss and weeds. Liming rates are best done after performing a pH test but this rate is a good guess for many lawns in the Willamette Valley. Spread the amendments over the soil and till it 4 to 6 inches deep. It is important to note, this is the only time you can provide soil builder under the lawn in the soil. If you don't build the soil now, the lawn will loose much of the air and drainage you just worked so hard to provide. Top dressing of amendments can be done annually to enhance a currently performing lawn, but not as a substitute for a lawn that was never amended in the first place. First rake the lawn with a heavy-duty grader rake. New rocks and sometimes "yard art" will pop up when you till. A grader rake levels the bumps created by the tilling and removes the large “chunks” while smoothing your soil. After the grader rake, use the landscape rake to remove finer pieces and shape your soil to the desired fine grade. These steps are critical to having a smooth and mowable lawn for years to come. Sod is heavy and it is easy to injure yourself moving sod around. Small amounts of sod can be purchased and picked up at a lawn and garden store. But more than 25 or 30 sqft should be delivered (unless you have a sturdy pickup truck and a strong back.) 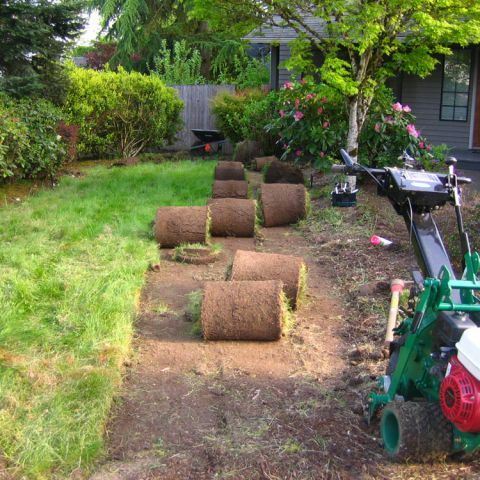 Once you receive your sod, roll it out across your lawn being sure to alternate the pattern. Snug the edges tightly so all of the soil is covered. Areas with curves and bends can be cut out of scrap pieces of sod. A serrated knife works well for cutting and trimming sod. Try to get a tight fit in most places so the lawn is able to establish and fill up any minor spaces quickly. Roll the lawn with a 1/3 to 1/2 full lawn roller to ensure the sod has good contact with the soil. Once the sod is installed, keep it moist. Be sure to keep the sod damp for at least 2 weeks especially if the weather hot. A deep watering of about 1" every 7 days is a good rule of thumb. Be gentle with the sod until it is well established. The lawn will be rooted in about a 3 weeks. About a week to 10 days after installation, you should mow your lawn 1 to 1 ½ inches from the ground level. Be sure your mower blades are sharp so you don't tug the new sod off of the soil. If you are at all concerned the sod has not attached itself, wait a bit longer to mow. It is better to have it attached then stress the sod with an early mowing.